Arnold Livingston Geis, LaMarcus Miller. Photos courtesy of Long Beach Opera. Before I switch into a more analytical tone, I want to take a moment to commend Long Beach Opera (LBO) for being one of the two most relentlessly progressive and trailblazing performing-art companies in our city. Only the Garage Theater (whose premier play, Opaline, I will review early next week) meets LBO in continually offering work that is challenging, theatrical and often unconventional. 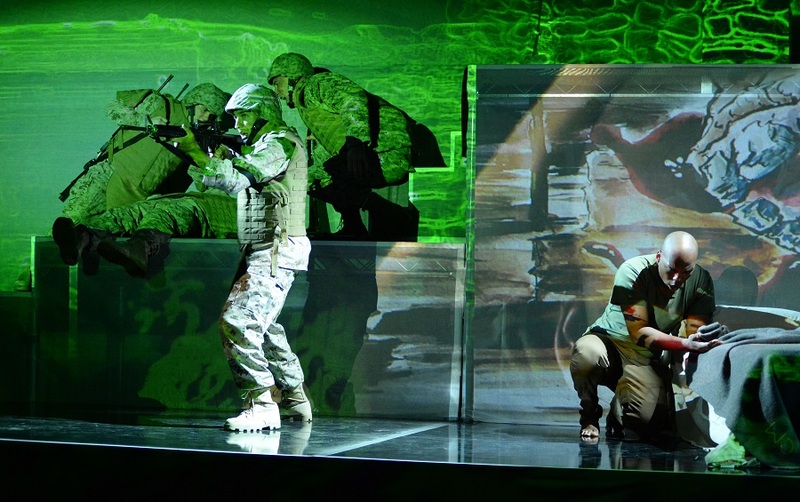 Regardless of my criticisms of Fallujah, if you are an opera lover; a history buff; a veteran or family/friend of one; a victim of PTSD; or if you have ever been curious about opera, what it’s like or if it’s still a relevant art form, GO! If you cannot make it, KCET is broadcasting Friday night’s performance live and will be re-broadcasting a few times as well. Don’t let the broadcast pacify you, however. 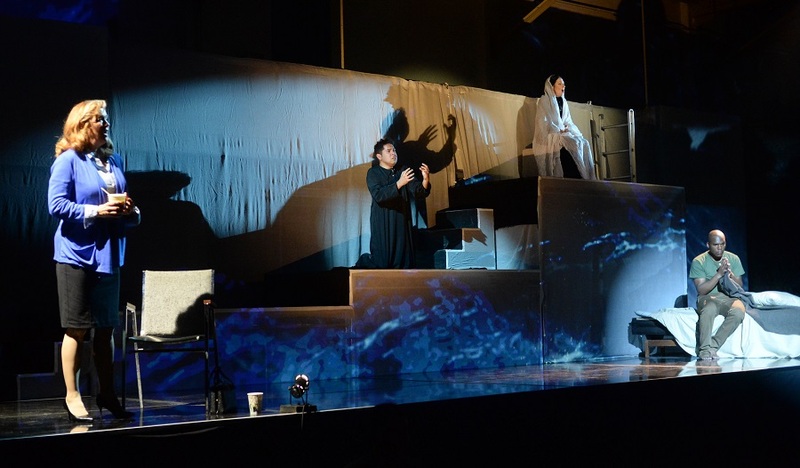 Live performance is meant to be seen live and Fallujah, running through this Sunday at the Army National Guard on 7th Street downtown, is as alive as the issues raised in the opera are real. Fallujah is a world-premiere opera about the Iraq war and the psychological effects that it continues to have on people on both sides of the conflict. Set during the Iraq war inside a VA hospital, the opera begins after USMC Philip Houston (LaMarcus Miller) has survived his third suicide attempt and is on a 72-hour watch. His adopted mother (Suzan Hanson) has come to see him but Phillip is too overwhelmed to let her into his room. Suffering extreme Post Traumatic Stress Disorder (PTSD) and incessant flashbacks to horrific events he has witnessed and participated in on the streets of Fallujah, the opera unfolds both in real and fragmented time as we witness both Phillip’s current state and the events that got him there. The opera itself has a diverse and affecting score by Tobin Stokes and a hard- hitting and powerful libretto by Heather Raffo. Stokes creates a tone that is diverse and multifaceted, suiting the inner demons that manifest and the many locations Philip’s mind takes us to. There are traditional arias, duets and ensemble pieces throughout and the multitude of influences touch on classical, Middle Eastern and rock music, changing as rapidly throughout as Philip’s visions come and go. Heather Raffo’s libretto is both poetic and visceral, essential for an opera to be engaging and theatrically affecting. To this extent, she nails it. Working with former Iraq veteran Christian Ellis, whose time in Fallujah is the inspiration for the opera, the impressive level of authenticity in Raffo’s libretto and Stoke’s score allow us to travel in and out of real and remembered time, allowing us to see parallels between those fighting the war and those living through it on the other side. When the ending finally arrives and all of these competing elements finally settle into place, the effect is breathtaking. The last 15 or so minutes of Fallujah are as beautiful as anything you are likely to see on stage this year. That said, for all of Fallujah‘s stylistic changes, I wish there were more tonal changes. In the world of an opera, music permeates everything and because of this, it is hard to change an opera’s dramatic tone without it being anticipated or feeling contrived. While much of Fallujah’s impact comes from its brevity and dramatic tautness, without having any insight into the past lives of these characters we are distanced ever so slightly from what is at stake. We do get a touching moment of this tonal change early on in the opera when one of the soldiers sings a beautiful aria about his daughter back home under a sky full of stars. With all of Phillip’s terrifying flashbacks, I was left wanting a break from the torment, a chance to see what his life was like before all of this. With a structure that so winningly uses flashback, I was disappointed that this was an avenue that remained not taken when I feel it would greatly add to the opera, both emotionally and tonally. Front: Gregorio González, LaMarcus Miller, Back: Arnold Livingston Geis, Jason Switzer, Todd Strange. The production qualities of the LBO production are innovative and often stunning. 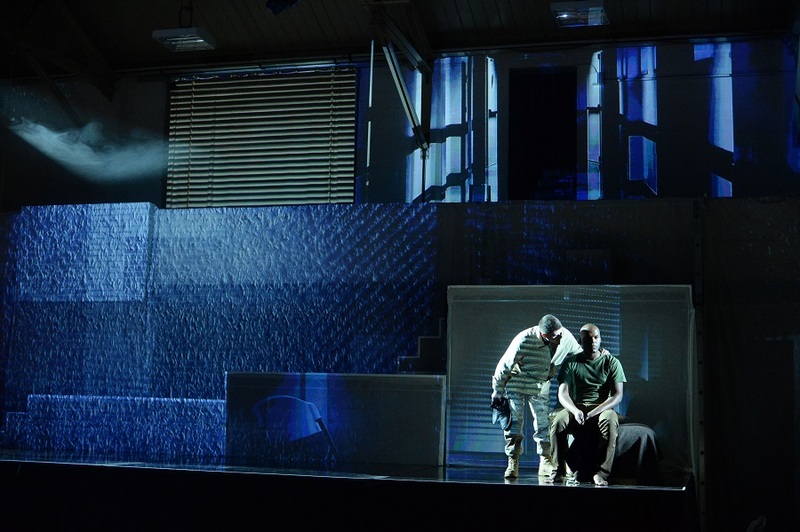 The direction by Andreas Mitisek (who is also the artistic director of the company and the production designer) uses the multi-level set inside the Long Beach Armory to its full advantage, creating clear lines of focus and dropping a few surprises along the way. That said, while I understand conceptually why Mitisek chose to keep Philip physically in the confines of his room, I feel it would have been more effective to have his flashbacks take him away from his room and then return him there. It might have helped bridge the gap between reality and hallucination for the audience as well. All elements of the technical production were astounding, but none as much so as the video design by Hana S. Kim. Kim’s work is some of the best-integrated and transportive video design I’ve ever seen in a theatrical production. Suzan Hanson, Jonathan Lacayo, Ani Maldjian, LaMarcus Miller. The small orchestra under the conducting of Kristof van Grysperre was in top form as always with LBO, and the sound design by Bob Christian was clean and effective. 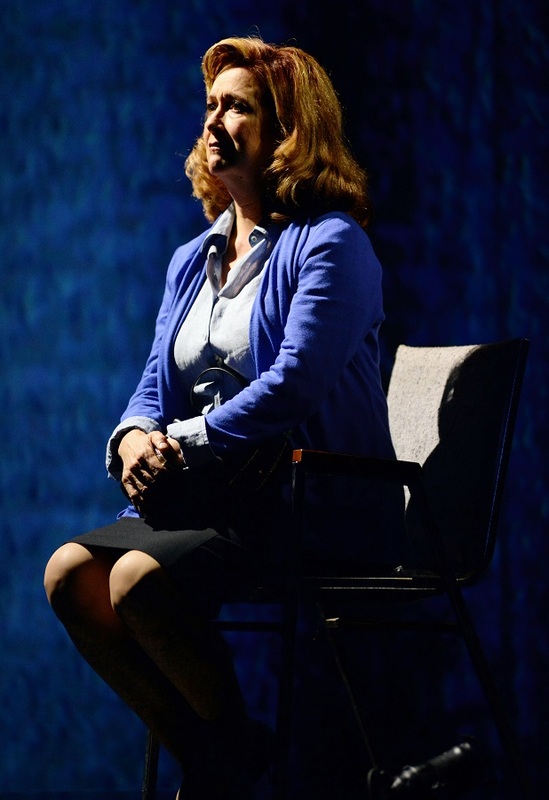 Although everyone in the cast deserves praise for the bravery of their work, no one stood out to me as much as Suzan Hanson, playing Philip’s mother. Her ability to align her expressive voice with her phenomenal acting ability make watching her a transcendent experience. Whenever she is on stage, she holds us in the palm of her hand. In spite of its minor inconsistencies, Fallujah is an important opera about a disorder that millions of people all over the world suffer from. Seen through the lens of one of the greater tragedies of our country’s history, it is an important and powerful piece of work.